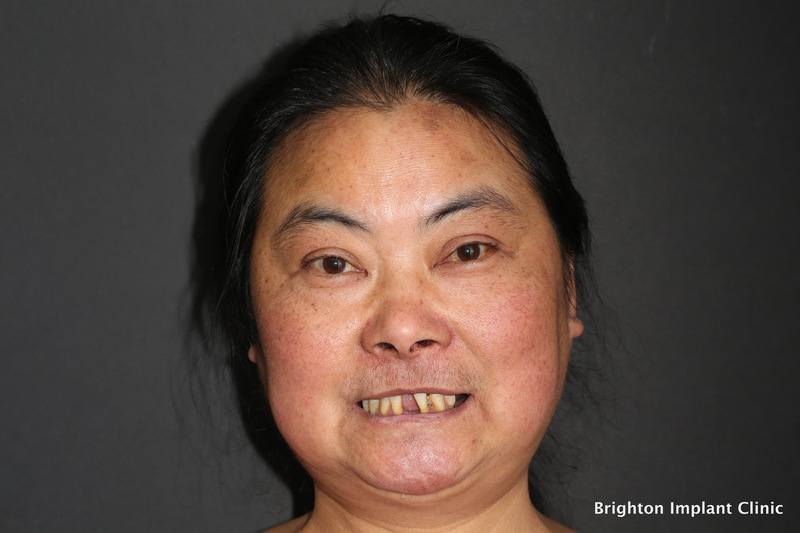 Guomei came to us for a free dental implant consultation after looking for an alternative to dentures. During Guomei’s consultation and evaluation, we discovered she had multiple missing teeth as well as some underlying dental health issues with her remaining teeth. Currently using dentures, Guomei described common problems many people have with dentures such as discomfort, problems with speech, and eating. We assured Guomei not only are dental implants a permanent solution, but they also eliminate common problems associated with dentures. Before undergoing any procedure or treatment, a patient must have a cone beam computed tomography – a CT scan. 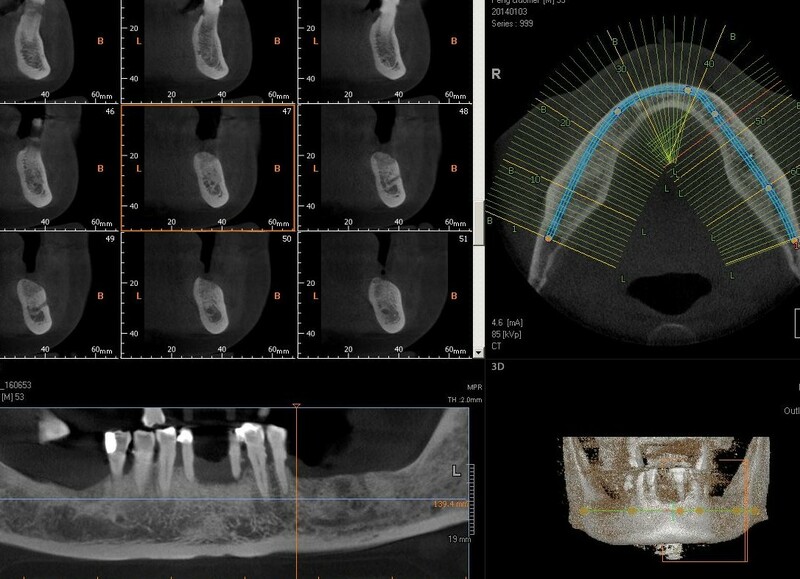 This is to evaluate their suitability for dental implant treatment. As bone is fundamental in any dental implant treatment, a CT scan allows us to evaluate bone height, health and density. Following a thorough examination of Guomei’s remaining teeth, it was decided that the infections were to be treated and eradicated, and for the remaining decayed teeth to be removed. 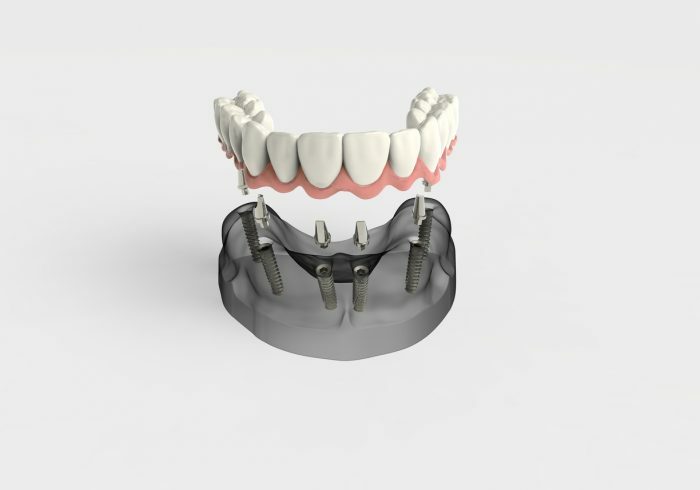 A removable denture will then be made so that the bone could heal ready for dental implants. 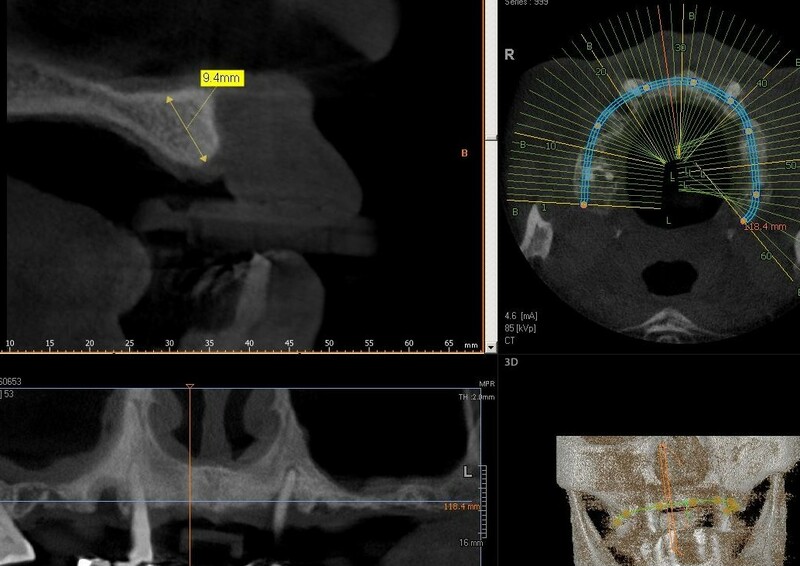 Guomei’s CT scan showed that there was sufficient bone in the lower jaw for the all on four treatment, which is, a dental bridge, fitted with 4 dental implants. However, there was not enough bone towards the back of her mouth on the upper jaw. We talked through potential options with Guomei such as bone grafts, and it was decided that Zygomatic implants would be the best option for her case and the success of her treatment. There are different available treatments for different patients who have insufficient bone for dental implant treatment, with advantages, disadvantages and risks to each approach. Using Zygomatic implants it was decided that Guomei would have 6 implants in the upper jaw with 2 of those being zygomatic implants. After all infections were cleared and Guomei’s remaining decayed teeth were removed. There was a healing and monitoring time of 4 months as well as a further evaluation of her healing bone. Once everything had healed, Guomei was ready to book in her dental implant procedure. The implant procedure would be split into two. One for her upper jaw and another for the lower. Guomei choose I.V sedation during her treatment to calm her anxiety also known as sleep dentistry. 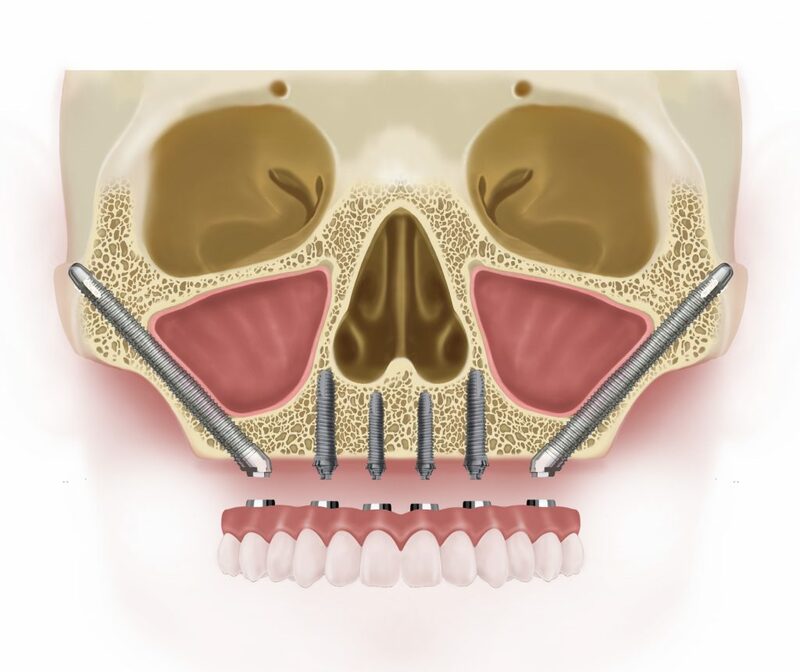 During her procedure, 6 implants were placed in the healthy bone including 2 zygomatic implants into the Zygoma bone. These were all successfully placed as well as stability tested following placement. This stability test meant that a provisional fixed bridge could be fitted the same day as surgery. This bridge will be very similar to the final bridge! That means that Guomei got to walk out of surgery will a full set of teeth on her upper jaw! Find out more about teeth in a day. After this, the implants are left to heal and checked again in 4 months. 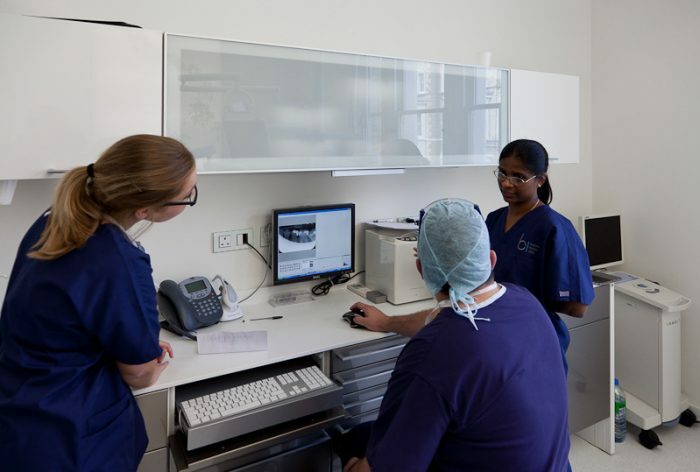 Our dental surgeon evaluates the implant placement, the healing tissue and gums as well as another CT scan to check the healing bone. Great news for Guomei is that all her implants had healed well and new impressions were taken for her definitive bridge. Guomei and every one of our dental implant patients is reviewed 6 months following their last appointment of their course of treatment. This is to ensure that the patient is happy with their dental implants and they are being maintained well. Our patients will then be booked in yearly for a checkup just as you would your natural teeth. If you would like any more information about our dental implant treatment, Contact the Brighton Implant Clinic or Call us on 0800 111 6623 .